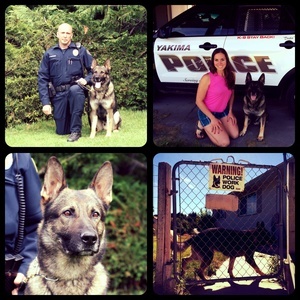 During the last week of April, the Paw Print Genetics team again paired up with the Spokane Police and Sheriff's Department, our hometown law enforcement agencies, to work toward better genetic health for service dogs such as the patrol and detection dogs found in K9 units across the country. 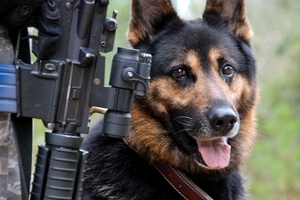 Spokane hosted the Washington State Police Canine Association’s Spring Seminar, which ran April 28-30, and which featured training scenarios that consisted of obstacle courses, canine first aid and building searches for patrol dogs, and scent detection of vehicles and training on a scent wall for detection dogs. 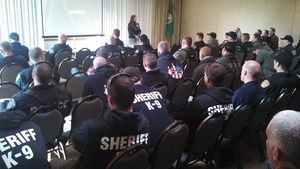 Paw Print Genetics was on hand to work with the various law enforcement agencies from across the state to educate them on some of the genetic diseases their breeds of choice are prone to inherit, and what they can do to protect themselves as an agency investing taxpayer money. The participating K9 teams were also kind enough to let us take cheek-cell samples of their dogs (or were nice enough to do so for us if their dogs weren’t fond of strangers fiddling with their mouths).